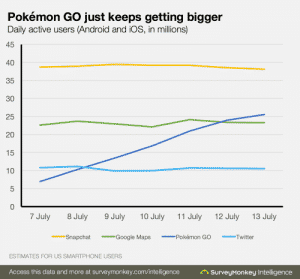 I think it’s fair to say that Pokémon Go is now a worldwide phenomenon. What it took the brand years to do originally, has now transformed the way kids and adults are gaming around the world. It’s hard to have imagined a conversation 3 months ago, 32 year olds, having a chat about what level they had reached on Pokémon, but the time is now here. (I use this example as a friend and I were discussing this last night). “Who cares?” or “Why is this important?” Two questions that have come up a fair amount over the past few days whilst I’ve spent my free time trying to understand, play and talk to people about Pokémon Go. As you can imagine, there is a pretty clear split and you will still meet people who will have absolutely NO idea what Pokémon is, or have any interest in it and that’s fair play. It’s not for everyone. 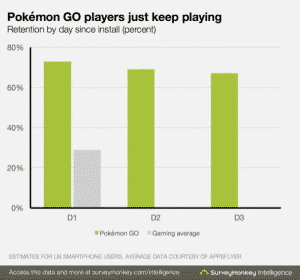 I wrote a quick piece on LinkedIn last week, after a few days of Pokémon Go’s release in the USA and Australia. It was taking off, it was going crazy and no one really knew just how big this could become. My interest was peaked by the fact that the game requires people to move around the real world in order to advance in the virtual world. It’s all about Augmented Reality (AR). This has to be a first for children and adults for quite some time. A video game that REQUIRES exercise in order to progress. Could this be the way we finally get kids off the sofa and moving around? Albeit walking around so far, but it’s one hell of a start isn’t it? Having played the game a little now, I’ve seen just how much we could be asking this new generation of Pokémon players to move. If you remember what Nintendo tried to achieve with the Wii, a console that was all about getting up, bowling for real, playing tennis by swinging the controller and boxing by punching towards the television. Take that concept, but instead make people walk around to be able to play the game. You see you can find eggs in this augmented reality, and these eggs can be incubated so as to find new Pokémon. So how does the incubation work? Simple, you need to play the game and walk between 2, 5 and 10 kms. If you want to battle the newly found Pokémon that you have, you need to visit a gym to be able to challenge other players. Gyms are scattered around the place, but it requires players to relocate to that area (you have to be sufficiently close to the location to be able to access the Gym). This is amazing, it’s a concept that if pitched to the makers of Call of Duty or other Multiplayer online games, would have been laughed out of the room. People “WANT” to sit in front of their TVs all day, don’t they? So in that short piece on LinkedIn, we were looking at small business owners that were using the tools in the game to encourage people to come and spend money in their business. Again, the merge of real world and virtual world started to impress me, but really made me think about the possibilities and the potential. The example I found was a Pizza joint using “lures” in the game, attracting more Pokémon, meaning people could sit there, have a slice and a drink and catch new Pokémon at the same time. He saw positive results, for a small spend of under $1.50 per hour, he had customers coming round, finding Pokémon and purchasing something whilst they were there. So, the potential for businesses is clear. In fact, I think it’s going to be a huge opportunity for small local businesses for the foreseeable future. Does this compete with Facebook localised advertising? 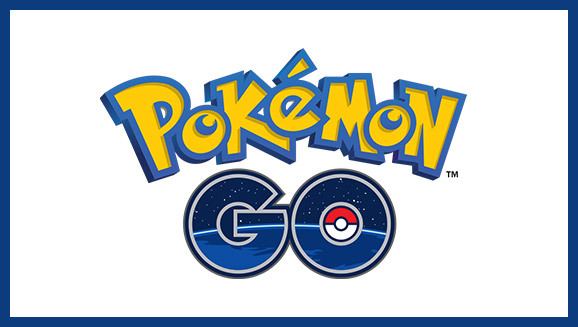 Maybe for a short term, but it will really depend on the development of the game and that’s up to Niantic. I wrote my piece on how this could be a great local business advertising platform on 13th July, by the 15th Niantic had announced that Sponsored Locations are coming soon to the platform. CNET ran the story, with McDonalds looking like they might be the first. It’s a clear way to go with the platform, revenue potential is enormous. Just for a bit more background, Niantic, the company behind Pokémon Go, is a California based start up, founded in 2010 by John Hanke. The company was formed as an internal start up at Google and it wasn’t until 2015 that it spun out as an independent company. By then they had already released 2 titles. Field Trip, which was meant to be a guide to cool, hidden and unique things that you could find in the world around you. By using the basic technology, understanding where the user is, you can identify points of interest around you, giving people the ability to find out more, link to other references and being able to walk around and discover what you probably didn’t know was just around the corner. Their next release was Ingress; this is an augmented reality game released in 2012. It has a science fiction back story and forces players to choose one of two sides. Although players never actually come up against each other directly, they “fight” on behalf of the cause that they chose at the beginning of the game. By visiting real world locations, you can capture “portals” and slowly create virtual triangles called “control fields”. It can seem quite complicated at the beginning. I won’t go in to this game too much, but it does setup why I think a coupe of key features in the Pokémon Go game are going to become very apparent later on. These may even be how this game does what so many others failed to do, keep people’s interests long term. The team aspect in Ingress means that all the time that you are playing, you are constantly checking to make sure your team is ahead, especially in your city. If you noticed, when you eventually reach level 5 in Pokémon Go, you are asked to choose a team when you first visit a gym. 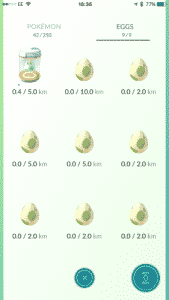 Now, to make this clear, I have no way of knowing if this will be the case, nor do I have any inside sources at Niantic, but, if I was looking at how to give this game some real longevity, I would have to consider how to start to position the game with a local, regional, country wide score based system to make this more competitive. The second thing that still hasn’t been taken in to consideration is how this game has grown since it’s initial release on the 6th July in the USA. There is no “invite friends” like so many games have used in the past to help increase downloads. There’s no competition between friends, so no reason for me to go back in to the game to make sure I’m beating my best friend (we’re very competitive on all the games we play and eventually that competitiveness runs out once the game no longer has our attention, usually due to lack of continued development or growth). I don’t know how many of you have actually looked at the numbers, but they are RIDICULOUS. It’s the only word to describe it, well actually, Elon Musk would probably use the word “ludicrous”. The best possible sources (which are all estimated I’m afraid) put the download rate in the USA at an average of 4m downloads per day for the first week, the total being in excess of 30 million (that’s in 7 days). 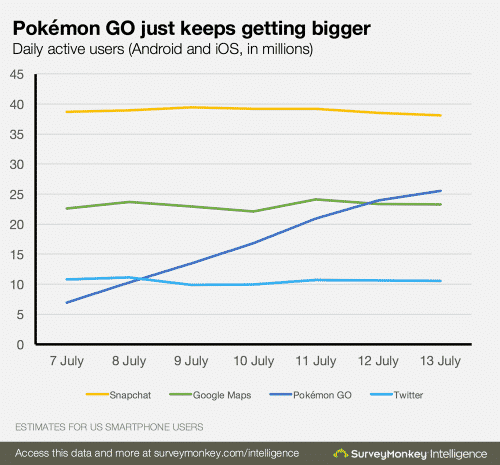 In only 13 hours, Pokémon Go had topped the USA App Charts. By the time it was released here in Europe it was even faster. Germany took only 3 hours to see it hit the number one spot. Anyone who works with Apps or for any of you who don’t, there is a statistic which is more important than the number of downloads, Daily Active Users (DAU). Now most apps, especially in the gaming industry, see a large number of downloads and then see a large number of people NEVER coming back again 24 hours later. The industry average is roughly three out of every ten downloads will come back the next day. This is often referred to as D1. 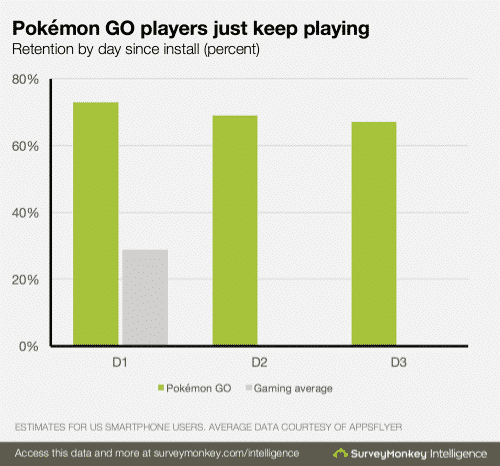 With Pokémon Go, the stats are more like seven out of ten coming back the next day. That’s more than double the industry average. In fact, by day 3 (D3), they are still showing in excess of 60% of users that downloaded the game coming back and playing the game. Not only are the download numbers incredible, but the DAU is equally insane. 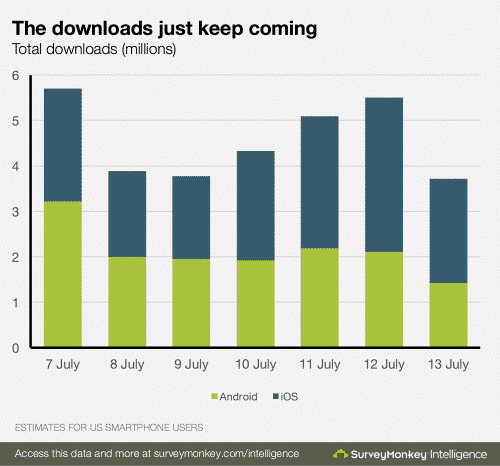 If we just look at the first week’s download numbers for the USA alone, it sets the downloads at roughly 30 million. At these rates of DAU, it means more than 20 million people are still playing the game on a daily basis. 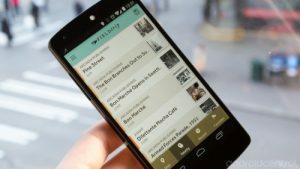 Google Play does offer some additional information, something that unfortunately Apple doesn’t, which is an approximation of downloads. As of writing this article on the 17th July 2016, it estimated between 10,000,000 and 50,000,000. (11 days after initial release). From what we can see on the Apple Store UK, the app has already had 2 updates and the sheer volume of players has caused issues with the games servers, seeing people struggle to log in at some times. In fact, as I’m writing this article, news is coming up that there are issues today with servers not being able to cope and therefore users not being able to log in and play. Remember now, this is all without their being any kind of social side to this game, or is there? The social elements of so many popular games, like Clash of Clans, Boom Beach or Candy Crush, were always based on the leader board system. “Am I beating my friend?” The sheer numbers of people playing Pokémon Go makes me think that people are out and about, and the social aspect is actually real world interaction, which again is fantastic. Not only are people getting out and about to play the video games, they’re getting exercise and they’re socialising too. This is progress compared to the past 20 years of gaming. No more will gamers be sun deprived, zombie looking humanoids appearing from the basement of their parents’ house. Hell, they may even get a tan if they’re out and about playing today. 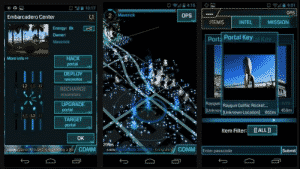 Thirdly, the game’s location based Gyms and Pokéstops have been created based on Niantic’s previous release, Ingress. What Ingress have that Pokémon Go doesn’t (YET in my opinion), is live events. They have continuous quarterly competitions called Anomalies and more importantly live 1 day events called Mission Days. Now, bearing in mind as I mentioned earlier, you’ve reached level 5 and you’ve had to choose a team, this means live events and team based score systems have a huge potential to continue to build this game’s playability and therefore its following. Here’s an example. Imagine; Live Competition Day, 3 teams competing and anyone and everyone can come along and play (no cost). The event is held in an impressive place, such as Alexandra Palace and is sponsored by BIG COMPANY LTD. Imagine the possibility of using GPS location to let people know that on Saturday this event will be on. The sponsorship pays for itself by being “BIG COMPANY LTD Gym Competition at Alexandra Palace this Saturday”. Now of course to make it more interesting, every player that comes and takes part gets extra Pokecoins (the in game currency used to purchase more items). The winning team for the day (the team with most recorded wins from the 1-2-1 battles in the gym get an additional bonus. Maybe an item that you can’t buy, or that is limited edition (could be in game clothing that is branded by BIG COMPANY LTD for example). The winning Pokémon Go champion for the day could get a real prize for winning, something from BIG COMPANY LTD for example. Why run these sorts of events? Simple, build team competitiveness, offer prizes and limited edition content that cannot be bought or found in the game and increase revenue generation whilst building longevity in to the game. I am even sure that a location like Alexandra Palace would host it free, making a day of it, knowing that they could potentially get thousands of people to their venue easily. There’s even room there for a company that makes chargers and charging stations to be able to sell more advertising space. As I added earlier in the article, it looks like McDonalds might be first inline for the sponsored locations, which I personally think is a real shame. For the first time we’re getting people up and about, moving around, doing exercise whilst playing video games and now we are going to encourage them to go to McDonalds. It doesn’t seem right. But if I was McDonalds, I would want to be first in line and I would want to get this up and running as soon as possible to get the most out of this opportunity. Sponsored locations aren’t the APP’s only revenue source, it also offers in-app purchases like so many other games. 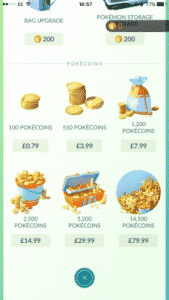 Pokécoins are available to purchase. The usual price points are available, £0.79 through to £79.99. Already in the USA, it appears that they are generating some $2 million per day with in-app purchases already. Since release date, if this figure hasn’t risen at all, that puts the US revenue for Pokémon Go at $22 million in just 11 days. Not a bad return for all involved, I’m sure you’ll agree. And it’s great for the whole industry, not just for Niantic and Nintendo. 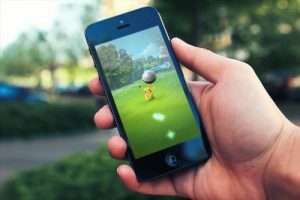 It’s brought AR in to the limelight and it’s going to inspire hundreds of more developers to start building similar ideas. Fitness apps that require people to engage with things outdoors. Run here, then run there, etc. It even got me thinking about a Treasure Hunt app, people could set up their own treasure hunts for charitable causes and to raise monies, where you have to follow along a set path to certain locations to find real life and online content, both only available once you are on location. Or for Sony’s latest release of Ghostbusters, a similar AR app, where you can catch ghosts using the Proton Pack, then the Trap and then having to take them back to base (home/office). There are so many options now that someone has set the standard. It’s also great to see retro brands like Pokémon being revived and brought in to the modern day technology. What other brands could be brought back? The other day some friends and I spent hours back and forth talking about 1980’s and 1990’s cartoons that we used to watch. Maybe one of those will be next.